Deck the Halls&hellip;and a Giveaway! Today I am off on a little holiday vacation with Seven and Jon. We are headed back to Great Wolf Lodge near Charlotte, NC, for a couple of nights family time. I’m looking so forward to the Snowland experience (It’s going to snow in the lobby! ), the writing letters to Santa, the indoor waterpark, and of course, MagiQuest. The last time we were there, Seven became a Master Magi, so this time, we will be doing the more difficult adventures…wish us luck! 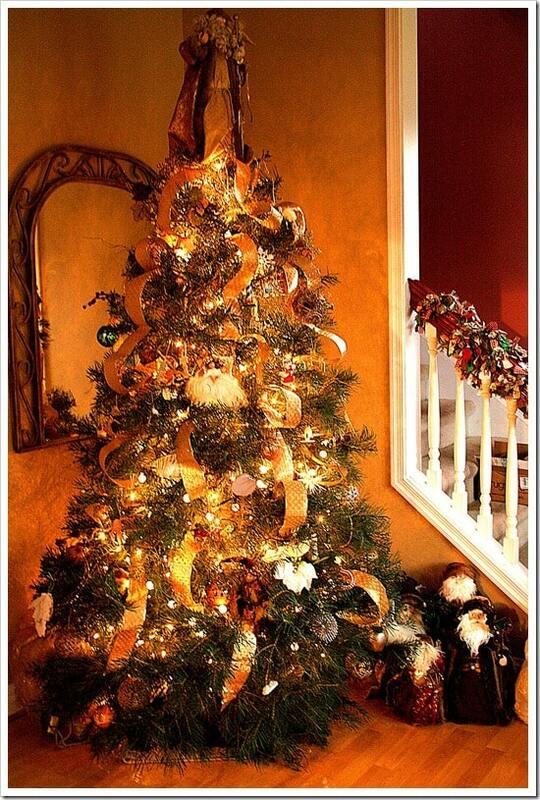 So, in the holiday spirit, I thought I’d share a little peek into my home as it is decorated for the holidays. For the past few years, we’ve gone to the Christmas Tree Farm in Newport to cut down our tree. We like concolor firs, for their long but strong needles and color. It’s always a fun little trek, but this year it took forevvvver. 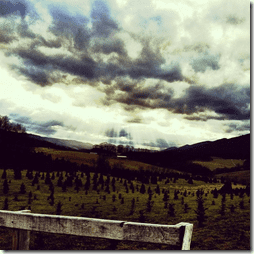 I think we looked at just about every tree on the farm. First on foot, and then on the haywagon. It isn’t a small farm. But, the wagon ride was fun, it was a beautiful day, and we secured a good looking tree. Unlike a lot of folks who change up their tree from year to year, or every few years, I am attached to my ornaments. I love them, and each has a special memory or relates to something I love. many we have brought home from our travels – like an amazing birds nest from Kenya, some antique style globes from Amalfi, some blown glass from Murano. 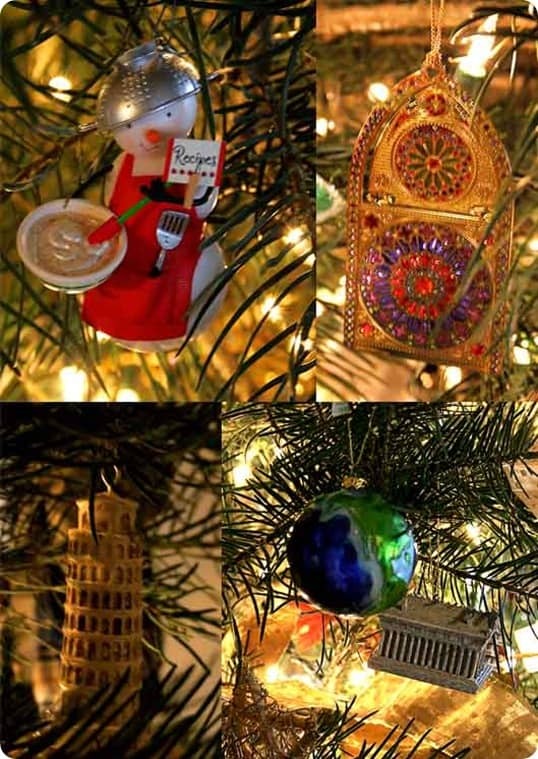 Then there are the ornaments that were gifts from friends and family, like the little Baker Snowman, airplanes to reflect our world travels, ornaments in the shape of famous landmarks we’ve visited. One favorite is a larger La Befana. 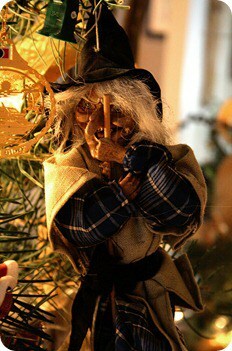 I bought this so-ugly-she’s-cute witch at the Christmas Bazaar in Rome’s Piazza Navona. it was beyond crowded, with stalls of artists, ornaments, toboggans, street foods. Bustling and vibrant, and one of my favorite memories. She now graces our tree, ready to bring us gifts in early January. What are YOUR favorite ornaments? Don’t you just love unpacking them every year, remembering where each came from? Who bought them for you, and what they mean? it’s one of the best parts of the holidays for me. Another great part of the holidays is sharing. Remember those cookies I posted on Monday? Well, they were packed up, wrapped up, and mailed off to a friend. I was fortunate this year – I’ve had more good than bad, more ups than downs. My friend? Well, she’s had a few more downs, especially in the money department. I’ve been there (I AM there), but thanks to McCormick, who also supplied me with a few baking goodies and spices, I was able to send her a $100 Visa Gift Card. I hope that will help brighten her holidays for her and her child…she deserves it. So, thank you, McCormick, for the opportunity to share…it feels good. 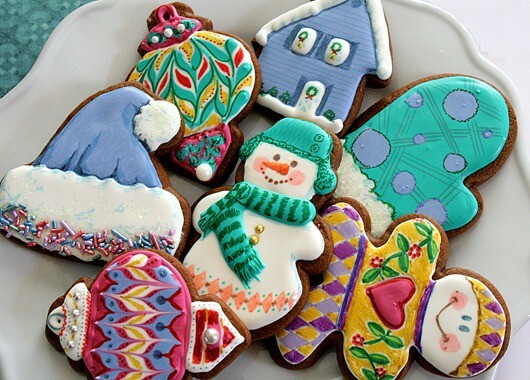 You, too, can share with your family and friends, at least in the virtual cookie department. McCormickhas a fun way to “decorate” a cookie with a message on their Facebook Page, called the Big Cookie Share, and you can send these virtual cookies to your loved ones. Cool, huh? Give it a try! 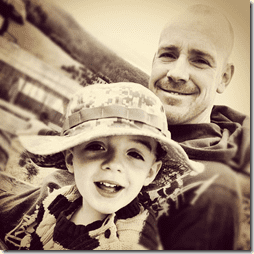 I gave away a great VTech Phone a couple of weeks ago. it’s an amazing phone! (It has a headset, so if your hands are full of flour, you’re okay to talk!) It’s been a godsend here in my crazy kitchen…so many great features, especially the spoken call ID. Love it. I don’t have to screen my calls, the phone tells me who’s calling! 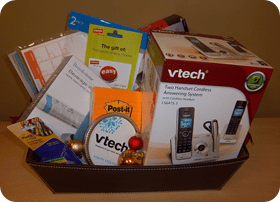 Now, thanks to VTech, I have ANOTHER phone to give away, except this time, it comes with a few more goodies! Nice, right? I want it, too! But, let’s give it to one of you. Leave me a comment here, letting me know you’d like to have it. Do that, and you’re entered to win. For another entry, please share this post with your friends, either on Facebook or Twitter (or both), then return here and let me know you did so. Each share counts, so if you share it on both sites, that counts as two entries. Of course, I’d LOVE to have you as a Fan on Facebook. Become one? Ask your friends to become one? The more friends I have there, to more great giveaways I’ll be able to have, and we all love giveaways, right? So, come on over and join me! Do that, and you’ve gained yet another entry…just be sure to leave me a comment here letting me know you did. Prize is courtesy of and is shipped by VTech. ERV $300. US addresses only, please, sorry internationals. Contest is open until December 13, 2011 at 11:59pm EST. Good Luck! See that 7 Quart KitchenAid? I know you want it. I certainly can’t blame you. So, to keep it fun and interesting, I’m giving you LOTS of extra opportunities to win it. For every giveaway you enter during my 25 Days of Doughmesstic Christmas, if you’ll go comment on THIS POST (Click thru!) 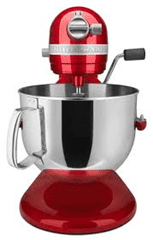 saying “I entered to win the …” (you know, whatever you entered to win), you’ll get a BONUS entry to win the mixer. That’s 24 additional chances to win that bad boy. So scoot! Go enter to win today’s giveaway, and then visit THIS POST to comment for your bonus entries on the mixer. Good Luck, and see you back here tomorrow for more fun things to win! Originally published on 2011-12-09 by Doughmesstic at Doughmesstic .